An added feature of the 2016 Sonoma County Barrel Auction was a 2016 Sonoma County Wine Icons Library Tasting held at Martinelli Winery on Thursday, April 28, 2016. This event was an invitation-only VIP reception to honor four icons who helped shape the heritage and history of Sonoma County winemaking. Helen Long Bacigalupi Along with her deceased spouse, Charles, Helen founded Bacigalupi Vineyards. 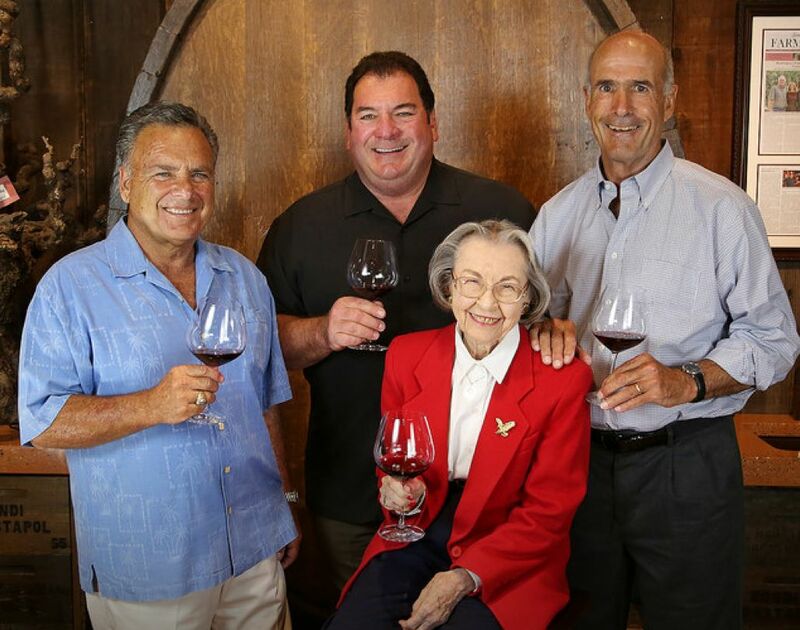 At 90 years of age, Helen Bacigalupi is celebrating the 60th anniversary of Bacigalupi Vineyards and three generations of her family’s Russian River Valley heritage. Among her many accomplishments, she provided a significant portion of the Chardonnay grapes in the 1973 Chateau Montelena blend that won the famed Judgment of Paris in 1976. I have talked with Helen many times and she is a remarkable matriarch of the Bacigalupi family. Tom Klein A fourth generation California farmer, Tom Klein earned a business degree from Stanford and spent the first part of his career as a management consultant at McKinsey & Company. In 1989, Tom and his family acquired Rodney Strong Vineyards and made the winery a leader in the movement towards sustainability. He also bought the Davis Bynum label and has continued the excellence of this Russian River Valley historic winery. David Americo Rafanelli David is the third generation proprietor of A. Rafanelli Winery. He was an integral part of the Dry Creek Valley becoming its own AVA in 1983, and bringing Dry Creek Valley Zinfandel to world class status. Tom Rochioli Tom’s father, Joe Rochioli, Jr., made history in the Russian River Valley when he began planting Pinot Noir on his family’s property in 1968. Tom was the one who persuaded Joe to make their own wine under the Rochioli label. He was one of the first to establish the single vineyard concept in California after a visit to Burgundy. From left to right: David Rafanelli, Tom Rochioli, Helen Bacigalupi and Tom Klein. Photo courtesy of Will Bucquoy for the Sonoma County Vintners.